T-shirts will be offered to the first 100 pre-registered runners before June 24. All finishers in the kids race will receive a specially designed Angevine Farm Kids Race medal. Angevine Farm is located 20 minutes north of New Milford via Route 202 east to Route 341, or 25 minutes west of Torrington via Route 202 to Route 341. Once on Route 341, turn north onto Angevine Rd. The entrance to the parking for the race is about half mile up the hill on your left. The Angevine Farm Half Marathon begins at ends at the northern end of the Angevine Farm near the main parking for the tree farm area. Runners will do a 1.7 loop on the farm before crossing Angevine Rd. onto a mix of single track/double track trails on the farm for the next mile. They will then enter the Wyantenock State Forest where they will run on old City Hill Rd. before turning onto the Mattatuck Trail at 3.7 miles into the race. Moving north on the mostly single track Mattatuck Trail, runners will experience mostly technical trails though most of is very runnable. Reaching the turnaround point at Hardscrabble Rd. at approximately 7 miles, they will return the same way they came on the Mattatuck Trail and through the Wyantenock State Forest. At about 11.3 miles they will west on City Hill Rd. (an abandoned road turned into a trail owned by the Warren Land Trust) before turning south onto Angevine Rd. A quick trip on the pavement and runners are back on the farm for a smaller loop of the tree farm and to the finish. Will we have water and/or electrolyte drink at aid stations plus other typical food items (potato chips, pretzels, candy, etc.) for the Angevine Farm Half Marathon. Keep in mind that Steep Endurance events are "cupless" races. Runners are required to carry their own hydration bottle, pack, or cup. This policy is put into effect in an effort to reduce the amount of waste and adopt a sustainable “green” practice for the race and the sport of trail running. Absolutely No Littering! Portions of the race are on the farm, CT DEEP State Park land, Warren Land Trust, as well as private property. Please respect that we are using their amazing and beautiful trails for this race. Failure to do so could jeopardize future events. Awards will be presented in the following age groups for both men and women in the Half Marathon race. All finishers of the kids race will receive a specially designed Angevine Farm Kids Race medal. You’ve just finished a super challenging one of a kind course! Enjoy your accomplishment, sit back, relax, and don’t forget to cheer on all the runners coming in behind you! We will have the usual spread including bagels, bananas, pizza, alcoholic and non-alcoholic hydration options. We may even have some live music for you! There are plenty of places to stay near Warren if you want to make a weekend out of it. The Hopkins Vineyard, just a short drive up the road from the farm, is also a great place to spend an afternoon. July in Connecticut certainly feels like summer, but can be quite pleasant, especially in the mornings. Average high temperatures are usually in the low 80's with low temperatures in the upper 50's. The year was 1868. The newly married couple of John H. Angevine and Mary C. Marsh were the first generation of Angevine Farm. The Farm has seen several farming endeavors over the last 6 generations. Dairy farming, tobacco, vegetables, orchard products, poultry and eggs, pumpkins and in the past 50 years, Christmas trees. The fourth, fifth and sixth generations are now in charge of running the plantation. John, Kathy, Timothy and his wife Carla, Scot and his wife Jamie, Lisa and her husband Ansie, and their children Haley & Jordan, all lend a helping hand. The Harvest Barn is a fairly new endeavor for the family. Originally built to house poultry, it now acts as our retail barn for the harvest season as well as a wreath factory in the winter. You can still see the feed pipes in the ceiling and chicken crates that remind us of earlier times. As children, Lisa, Tim and Scot remember planting pumpkins and selling them to “egg” customers that came to the farm. It always amazed them how a pumpkin could bring such joy. The harvest season is a wonderful time to enjoy the colors of nature and bring families together while exploring the many pumpkin patches on the farm. You can even tag your Christmas tree after pumpkin picking. Growing Christmas trees is really their full time job. It’s a challenging yet rewarding process that is constantly evolving. Each year 2000-3000 seedlings are planted, which is a family affair. The summer months are spent mowing, pruning, repairing machinery, plotting and planning. Never a dull moment at Angevine Farm, but we wouldn’t have it any other way. 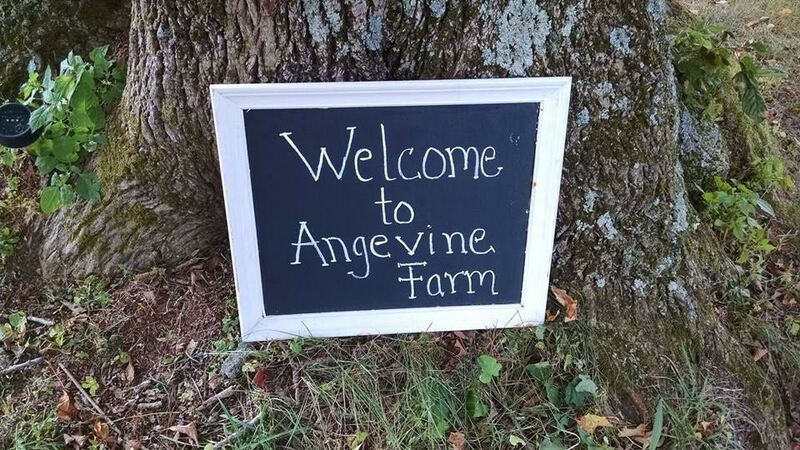 The goal of the Angevine family is to preserve the farm, continue and expand the agricultural history, and share the peace and beauty with our neighbors, friends and customers.